Band is a wonderful opportunity, for children in 4th-8th grades,to develop a better sense of musical knowledge, skills and an appreciation for music. It enriches their education by improving concentration, increasing hand-eye coordination and establishing good study habits. The band is showcased many times throughout the year including a Christmas concert, spring concert, and the Buffalo Grove Days parade. Saint Mary School has been proud to host the Catholic Schools' Band Directors' Festival and Solo Contest for 35 years! As a "sneak peek" at the band program, our band offers a free six-week flutofone class for all Saint Mary 3rd graders in the Spring. At the conclusion of this program the 3rd graders join the band in the Spring concert. Click here to access the band website. The school chorus is comprised of students in 4th-8th grades who have a love and enthusiasm for singing. The Sr. Girls Choir (6-8 graders) meets once a week before school while the Jr. Girls Choir (4-5 graders) meet once a week at lunch time. Students practice engaging in proper breathing and singing techniques and sing a wide variety of sacred and secular two and three part repertoire. 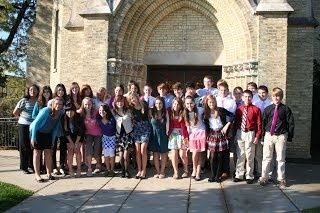 The Chorus sings for special school Masses, services and performs in a spring choral concert. Please contact Mrs. Blomeke at ablomeke@stmarybg.org for more information. The Parish Children's Choir is a K-8th grade choir that meets weekly in the evening and sings for monthly 11:30 a.m. parish masses. The choir is open to all SMS students and parishioners. Please contact Mrs. Blomeke at ablomeke@stmarybg.org for more information. The Spring Musical is one of the largest performances held throughout the school year. Students in 5th-8th grades are encouraged to audition and participate as cast and chorus. In addition to singers, actors and dancers, 7th and 8th graders make up the pit orchestra and stage crew. Past musicals have included, "A Twist of the Tongue", "Once Upon a Mattress", "Tied to the Tracks", "The Little Mermaid", "Sound of Music", "Wizard of Oz" and "Bye, Bye, Birdie". Our Variety Show is one of the year-end traditions school children look forward to. Presented on the afternoon of the last full day of school, students in grades 5-7 are encouraged to share their talents with their teachers and peers. All types of acts are welcomed! Yearbook Staff is open to 7th and 8th graders. All interested students apply to the faculty adviser. Students work from January through June to take, collect and sort photos, they work on page design and book layout, and finally market and sell the book. The yearbook includes all school students preschool-8th grade. It is a beautiful memory of the year and Yearbook Staff is an enriching opportunity for students.